Valentine's Day falls on a Wednesday this year, and as much as I would love to wake up without an alarm clock, sip on my coffee and make a big breakfast for the two of us - it's just not going to happen. I wasn't going to let that ruin our traditional Valentine's Day brunch, instead I've whipped up the perfect make-ahead breakfast bread with a delicious strawberry jam. As I mentioned in my last post, Valentine's Day doesn't have to be about whether or not you're in a relationship and all of that other mushy-gushy stuff. For us and for me, it's a day to be a little extra kind, share a smile, give a compliment, and simply recognize love in all forms. Celebrating and sharing love is something we all want to feel. So, why not appreciate a day that reminds us to do just that? Cooking and baking is one way that I do share love with people. I focus on making real food recipes that taste as good as they look because I want to nourish bodies, fill bellies, and create conversation with the best possible ingredients. Making a recipe from scratch and watching all of the ingredients come together is the most rewarding feeling; then to watch someone try it and enjoy what you have just made, is truly indescribable. And when they don't enjoy it - well, thats just the nature of the business and you can't win them all! One thing that is always a hit in our house is any kind of sweet and healthy treats. Chad and I rarely eat processed sugars, but that doesn't mean we don't have a taste for something sweet every now and again! Plus, we both love snacking - maybe a little too much. Holidays are always the best excuse to have a little extra sumthin' sumthin' in the house and this Valentine's Day was definitely was no exception! I made my Chocolate Shortbread Cookies on Friday afternoon and they were gone by Saturday night. I mean they were as good as they looked - can you blame us?! With a little bit of extra time today, I couldn't help myself and I had to make something else for our Valentine's Day. 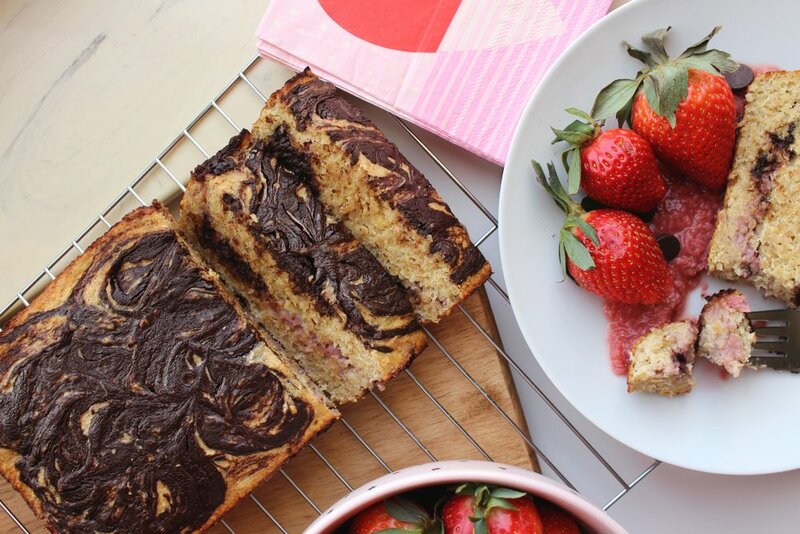 This chocolate marble breakfast loaf with homemade strawberry jam exceeded all of my expectations and I can't wait to have a slice on Wednesday morning on my way out the door! Maybe, just maybe, it will make it to the weekend and we can enjoy it over a warm cup of coffee. 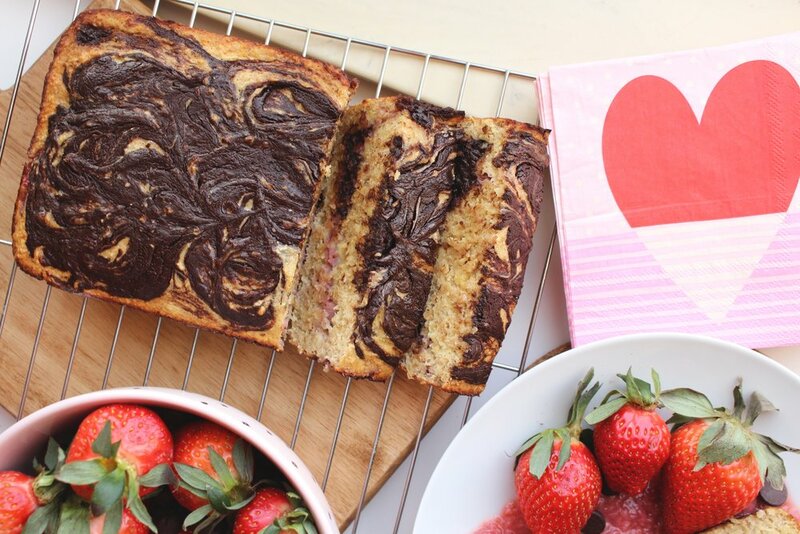 If your Valentine's Day morning looks anything but ideal and you still want to share some love, this breakfast bread will be perfect! With zero refined sugar and lots of fiber and protein, this breakfast bread is a healthy breakfast option that will keep you feeling full all morning. My homemade strawberry jam is also refined sugar free and great to have in the fridge for any occasion. I hope you and your Valentine love this recipe as much as we do! Start by slicing and dicing 7-10 strawberries for the base of your jam. 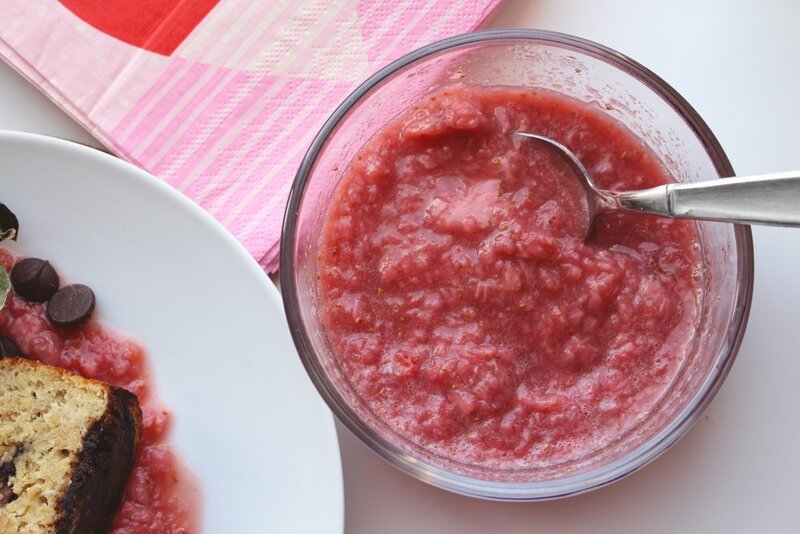 You can also use a food processor to ensure that they strawberries are finely chopped. Next, pour the diced strawberries and maple syrup into a pan and cook down for 8-10 minutes. Once the strawberry jam is liquified and smooth, it is ready! Set aside and prepare the chocolate sauce by melting 2 tbsp. of coconut oil and adding 1/4 cup of cocoa powder and 2 tbsp. of maple syrup to taste. In a large mixing bowl, mash three very ripe bananas and carefully stir in two full eggs. Continue stirring as you add the maple syrup, oats, flour, and protein powder. Once the batter is thick and creamy, carefully pour half of the batter into a lined loaf pan. 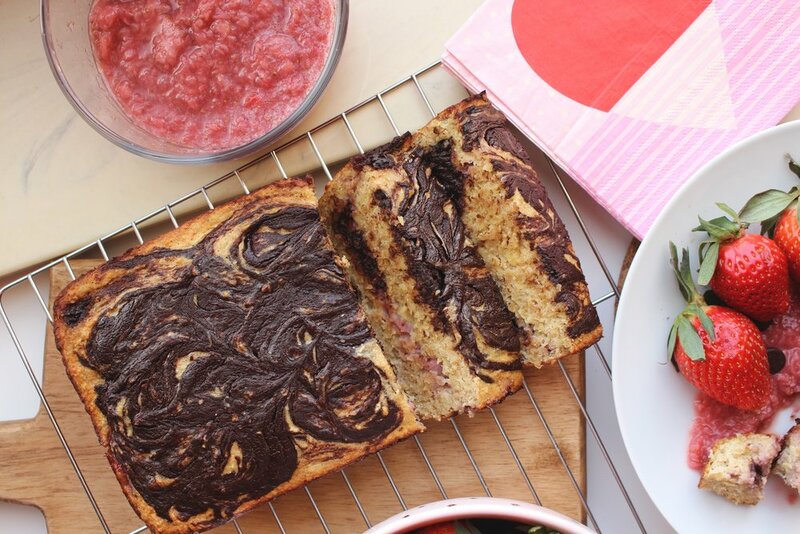 For a marble appearance, spoon strawberry jam and chocolate sauce onto the first half of the batter. Carefully swirl the batter, without over mixing, to create a "marble" look. Pour a second layer and repeat. Bake for 35-45 minutes or until the edges are golden brown. Since this is an oat based recipe, you don't want to over-bake this bread as it will become dry over time. Remove from the oven and let cool completely before serving. Slice into eighths and enjoy!